Takeru thinks about Alain’s words and wonders if there are no conflicts in the Ganma world. He is intent on befriending Alain in the hopes that they can understand each other. Meanwhile, a Ganma who is apparently a fan of Jack the Ripper attacks a woman in the fog by slashing her. Another woman with an umbrella watches from around the corner. Down in the Lab, Akari continues studying the Ganma piece and finally has a breakthrough. Out in the courtyard, Onari is training hard hoping to help Takeru since he cannot use science like Akari. Akari comes running and stumbling over to tell them about a strange woman in the living room. Takeru approaches her and she says she can see the future. She tells them about a monster in the fog before she faints. Takeru goes to get water as Onari and Akari remember news reports about young women being attacked in the fog. Five victims were reported to have fallen unconscious as if their souls were taken away from them. The woman wakes up just as Takeru returns and says she knows when and where the next attack will be. Onari and Akari argue over the validity of premonitions, waking Makoto up. Something changes in the woman and her eyes turn blue, her voice tone changed. 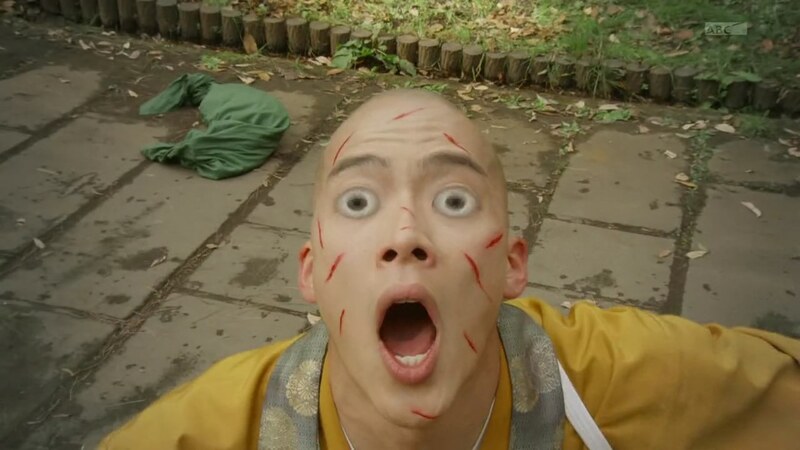 Just then, Newton Eyecon decides to fly away. Takeru runs after him and is able to catch him at the playground when Newton is on the swing. The now blue-eyed woman says the next attack will be in 30 minutes and goes on to detail where and exactly who will be attacked. She falls unconscious again. Onari and Akari head to the location and run into the fog when they hear a scream. It is just as the blue-eyed woman described. Something suddenly flies out of the victim’s body and right into a ball hanging around the neck of a suspicious looking man. The man says he is assessing the purity of the soul he’s just collected and orders Knife Ganma to take care of Onari and Akari. Onari decides to test out the results of his intense training. But Knife Ganma easily cuts Onari’s face up. Before Knife Ganma can finish them, Makoto arrives. He henshins and fights Knife Ganma while the man watches. 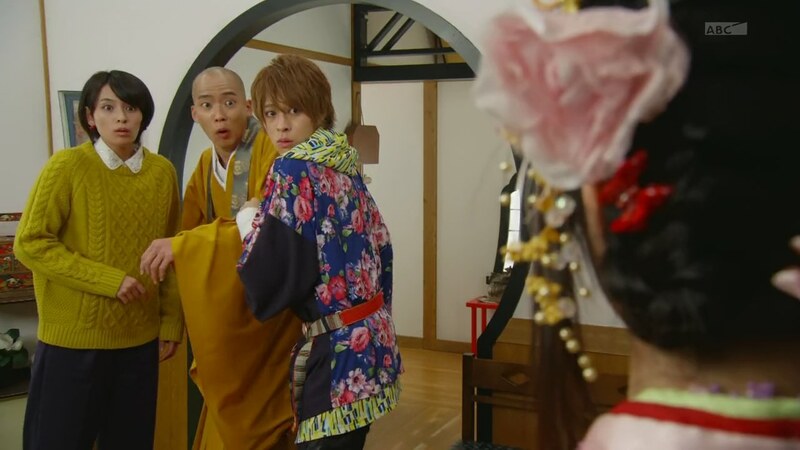 Takeru heads back to the temple and is surprised by the blue-eyed woman. She asks if he believes in other people’s strength and he says yes. Newton flies away again and Takeru follows him down to the lab. Grandpa Sennin pops in and teases the next Luminary: The queen of Yamataikoku, Himiko. Kanon wakes up to find her brother is gone. She comes looking for Takeru, but is scared to come down to the lab because of the monolith. Anyway, she tells him about Makoto-niichan disappearing. Yurusen pops in and suggests they use Condor Phone to find him. Makoto has gone Nobunaga and has Knife Ganma on his knees. The man tells Knife Ganma to hurry and finish this up, but Alain arrives and tells him to stop. Alain says he will take care of this. He tells Knife Ganma to step aside as he henshins. Alain easily forces Makoto to dehenshin. Alain, dehenshined, warns Makoto not to irritate him. 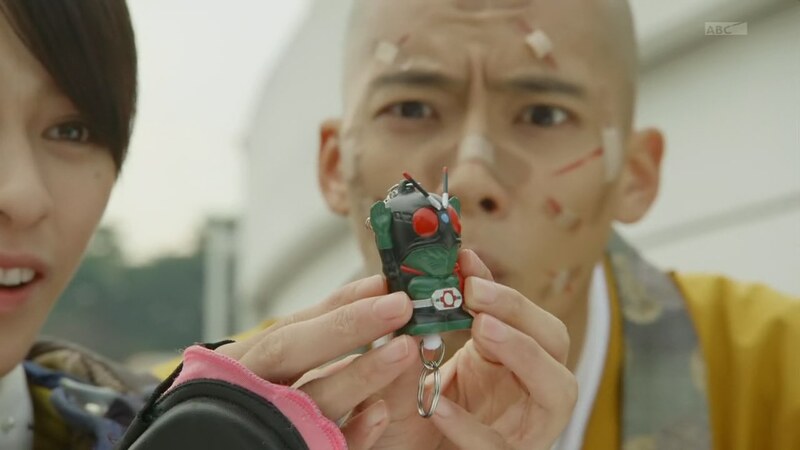 He takes the Necrom Eyecon and inserts it into Makoto’s driver. 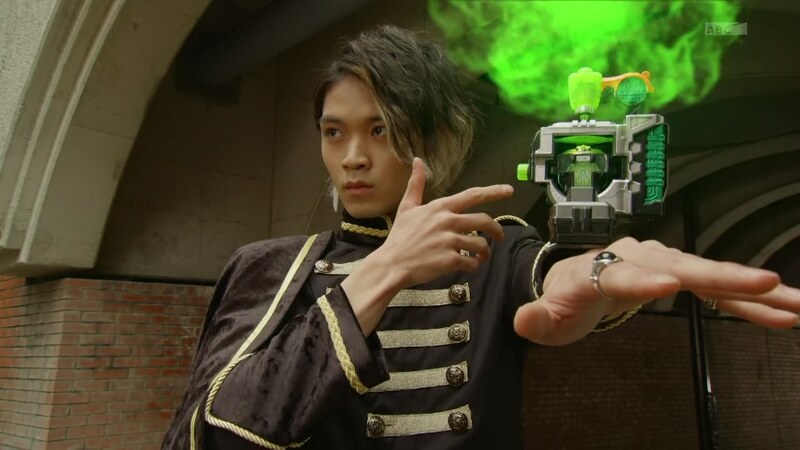 Makoto is forced to henshin into Specter Necrom. Alain smiles and says they have now become true friends. Akari and Onari reach the temple, but Takeru and Kanon have already left following Condor Phone. They instead find the woman enjoying some snacks. Onari is a little upset after his training failed him. The woman goes blue-eyed again with another premonition. Akari says she will handle this one, but Onari says they can’t handle a Ganma without Takeru. Akari assures him it’s okay as she’ll use the power of science to take it on. 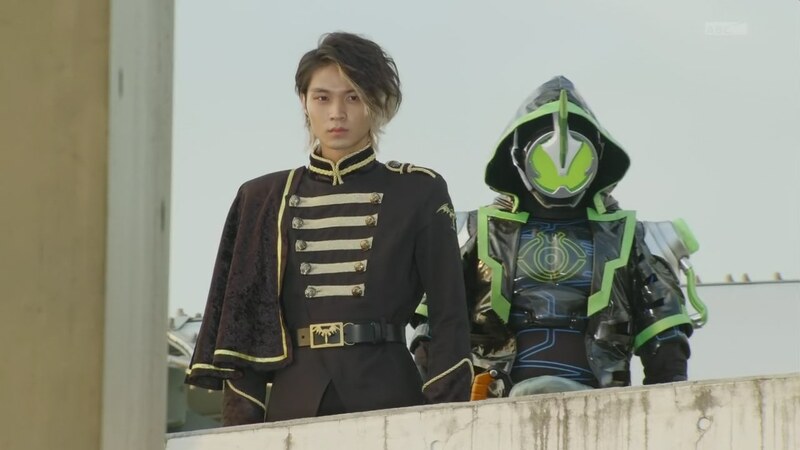 Takeru and Kanon arrive at the scene of the battle from earlier. Kanon finds her oniichan’s phone in the creek just as Alain appears. Kanon asks Alain-sama if he knows where oniichan is, but he says no. Across town, Akari and Onari arrive just as Knife Ganma is about to claim another victim. Onari gets the woman to safety. But Akari stays behind, dressed in protective gear and armed with a new anti-Ganma weapon she developed after analyzing the Ganma piece: Shiranui Plus. 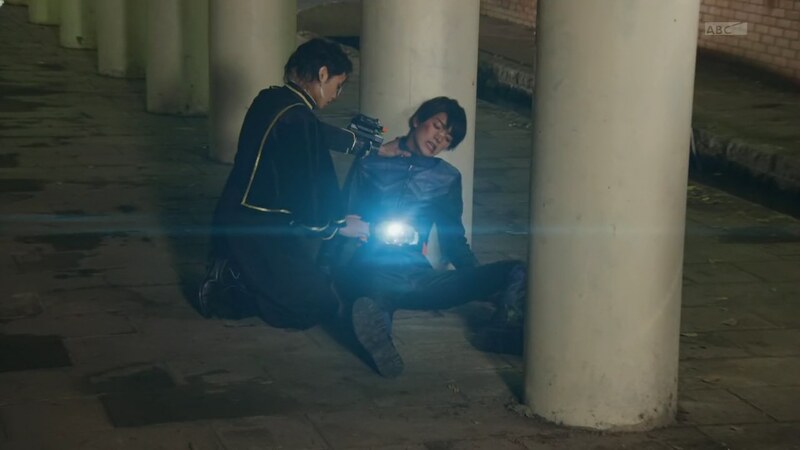 After Alain denies knowing where Makoto is, Takeru answers Onari’s call. But Onari is too panicked to speak clearly. Akari fires her new Shiranui, but the shot goes crazy and instead bounces off near Onari, knocking him out. Before leaving, Alain assures Kanon that her brother is fine. Akari doesn’t understand why Shiranui Plus didn’t work. But she realizes this fog is some kind of magnetic field. The man from earlier, Igor, approaches, amused that there is also someone in the world capable of critical thinking. Akari says of course since she is a scientist. Igor says science is called the Dark Arts in his world. And since she too is a critical thinker, she should know what a perfect world should look like. Igor explains that to maintain unity and harmony, they must eliminate all uncertainty. And humans are the epitome of such uncertainty. Imperfect beings whose inconsistent emotions lead to conflicts and even the destruction of this world. So to prevent that, the logical step is to modify them into conformity. And if that’s not possible… then elimination. 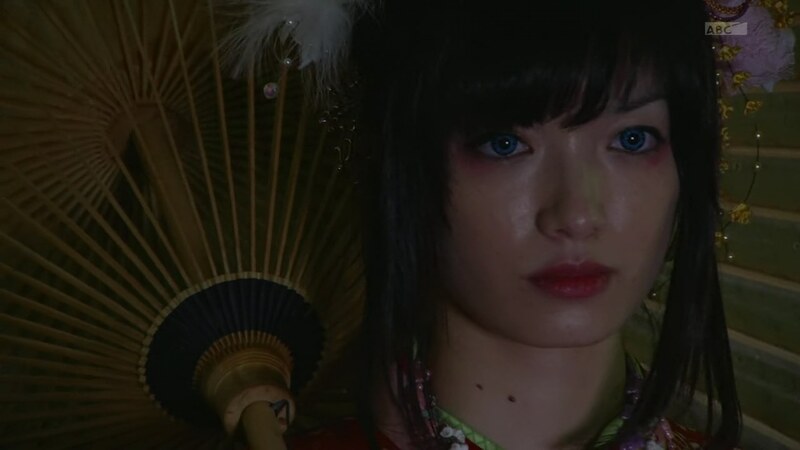 The blue-eyed woman steps over Onari who wakes up. She approaches Igor as he asks how they could have possibly known when and where he would conduct his “experiments” next. The woman admits she can see the future. When Igor summons Knife Ganma, blue eyes disappears again and the woman is scared out of her mind. Akari tries to use Shiranui Plus again to protect the woman, but Knife Ganma slashes at her. 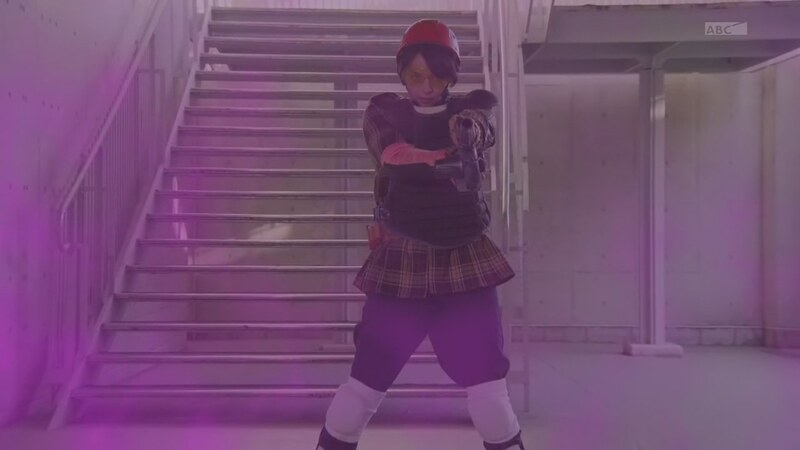 Takeru runs over just as Akari’s soul is sucked into Igor’s ball. Takeru is offended by such an insult, but Onari knocks him out of the way. Onari charges toward Igor, but Knife Ganma blocks him and takes him on. Onari is able to knock Knife Ganma to the ground. He is then able to avoid Knife Ganma’s shots by going Matrix, but his back snaps and he hits his head on the ground. Knife Ganma calls him a fool and Igor laughs that this is what humans are. Takeru will not stand for any more of their insults. He henshins straight to Boost. The woman stands and watches. Takeru fights Knife Ganma, but Igor releases the souls of all the women stuffed in his ball. And that includes Akari. Igor is able to control them, but Takeru can hear them crying for help. Takeru doesn’t know what to do so as not to hurt the women. An Eyecon flies out of the woman. The Himiko Eyecon! Takeru manages to escape the women trying to feel him up. He inserts Himiko into his driver and uphenshins. 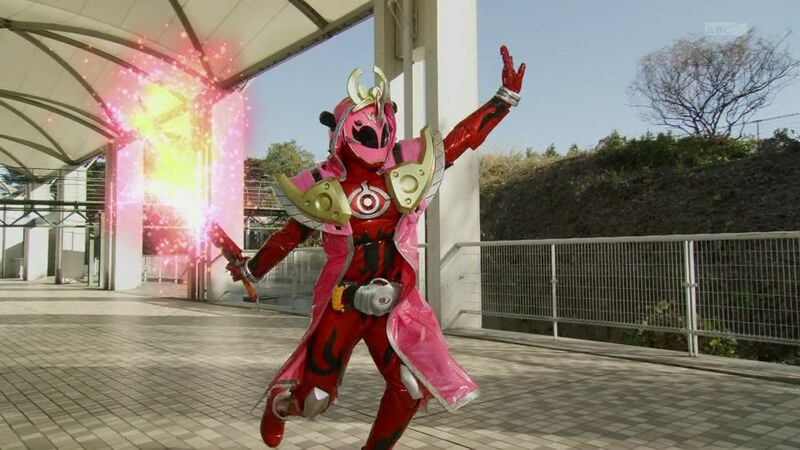 Takeru waves his sword and orders the evil spell controlling the women’s souls to begone. 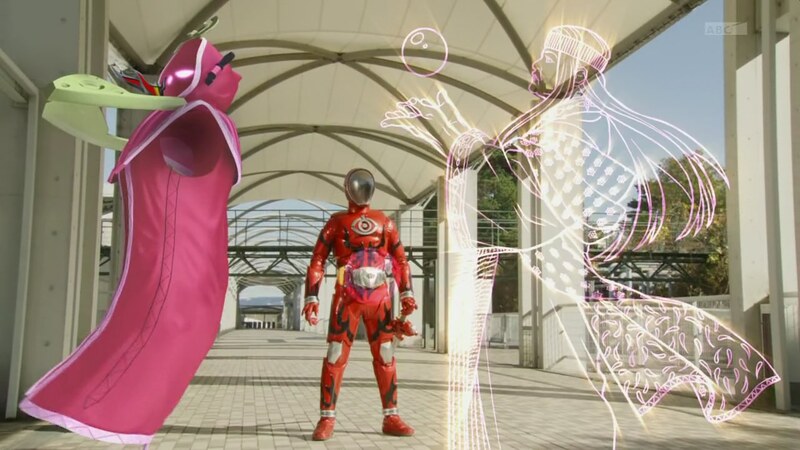 Takeru easily takes on Knife Ganma using Himiko’s power and an Omega Drive. Igor picks up Knife Ganma’s scissors and says he’s obtained the results he needs. Takeru joins Onari and Akari as the woman wakes up. Onari is excited to be in the presence of Lady Himiko, but the woman hands them her business card. She is Hino Miwako of the Himiko Research Group. She gives them a special token from the upcoming movie: little keychains of Ghost and some other Rider, a “legendary man,” she predicts they will meet soon. Miwako leaves and Onari and Akari argue again. Himiko tells Takeru he has interesting friends. Newton then pops out and flies away. Meanwhile, Alain is watching from above with Makoto as Specter Necrom by his side. So definitely not as amazing as last week’s episode, but still enjoyable. Himiko was fun. I actually thought she was going to be the new Ganma General that was teased in the bumper. But then Grampa Sennin explained exactly who she’d end up being anyway. lol It’d be great to have a female general though. But it’s even more awesome to see a female Luminary and female-styled power-up. And being used by a male Rider! There’s definitely plenty of female Luminaries and heroes they could use. It would be very refreshing and different. I like continuing to see Onari and Akari doing what they can to help. Onari charging toward Knife Ganma (they have names!) was dumb of course, but the sentiment is there. And I do like seeing them be involved in actual fights and stuff without being actual Riders. And hopefully in the future, they’ll be more than just damsels in distress. Sometimes these shows wait until the final battles to get everyone involved. So I hope they’ll do it much sooner here. I hope they drag out the reveal of Makoto, Kanon and Alain’s real relationship for at least a few episodes too. I’d be interested in seeing Alain sort of exploit Kanon’s seeming innocence and naivety. Maybe even obliviousness? But of course, anything is still possible with that whole plot point. Definitely lots of possibilities. It seems the Ganma World is basically North Korea though? lol Conform or be killed. Anyway, it was a fine episode. ← Recap: The Amazing Race 28, Episode 1 – "This is a bunch of bull." It was enjoyable but my gripe was that the episode was kinda all over the place. They kept jumping between the plots of Alain capturing Mokoto, Takeru interacting with Himiko, and Igor’s introduction without really tying the three together. 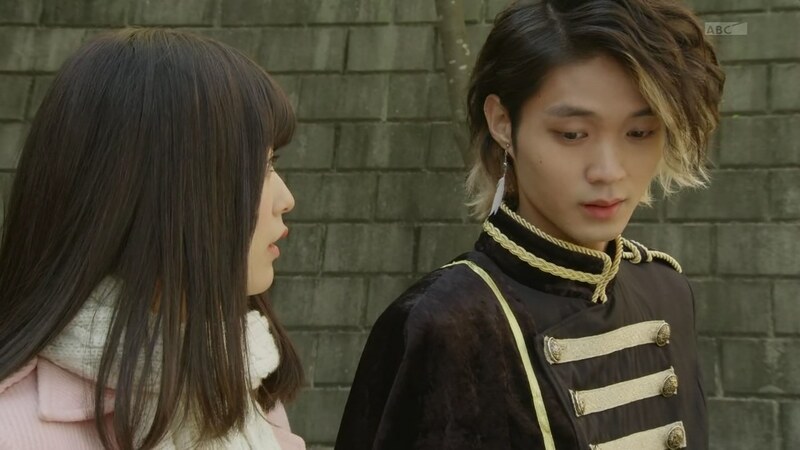 Miwako could have been on interesting character in the same way that Nagamasa (Ryoma’s “possessee”) had they just fleshed her better instead of her being just a convenient plot device for Takeru to get the Himiko eyecon. That debate between Akari and Igor was actually interesting. I hope they build up more on this. Akari’s character is really wanting, which is sad because she is supposed to be part of of that group of friends, but she really has yet to play her part on that particular plot.